This is my fourth Slice of life challenge, and I have seen how practice makes better. By writing every day in four Marches, soon I will have completed 124 pieces that I wouldn’t otherwise have written. And I know I am improving as a writer. 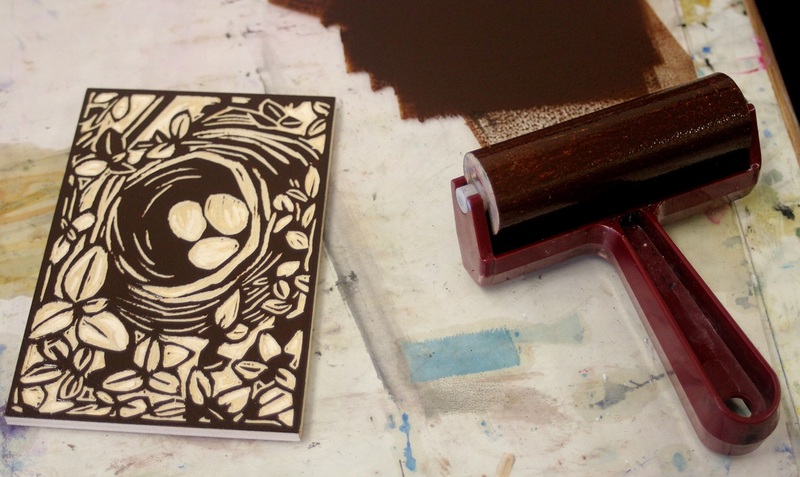 Daniel Pinkwatter wrote about a year he challenged himself to creating a woodblock print each day. (If you don’t know Daniel Pinkwatter, find out. Funny writer for both adults and children.) That idea intrigued me. March- Write and post a “Slice of Life” piece of writing each day, and comment on others’ writing. May- Read a poem every day. June- Listen to a new piece of music every day. July- Pull a weed every day. August- Do something unplanned every day. September- Maybe here is where I try those woodblock prints, except linoleum is easier so I’d use that. October- Play with the cat every day. November- Organize/cull a drawer/surface/closet every day. December- Write a friendly or loving card every day. Note: this image is from a workshop by Amanda Gordon Miller. I like this idea. I have done things like this before, always tacking on to March. I usually fizzle out by June. I need the outside accountability of a group to keep me going. What a wonderful idea. I am going to come up with my own. The adjective a day is something my fourth graders can do. I agree “practice makes better” or make things a little easier. I’m not sure I could only do those things in one particular month. I did laugh out loud at your plan for April, and I’m sure that I couldn’t only pull one weed. This is a great idea! I especially like the one about the “pull a weed a day.” I definitely should try that one! Good luck with your venture. I love this idea! Some years, I write a poem a day through April- that’s even harder than slicing for me!!! Flossing sounds much easier! It’s quite impressive when you add up all the writing you’ve done for the past 4 years in the month of March! I enjoyed your list and had to laugh at a few of your ideas. But you make a good point about what we can accomplish by sticking to something for an extended period of time – and I would love to see your linoleum prints. Your monthly challenges are a sweet mix of ambitious goals and realistic expectations! I love this idea! I need to include exercise in one of my months. Maybe I could focus on keeping my desk clean every day for a month:) You’ve given me a lot to think about! I love this idea. I may have to make a list. Great idea and something to think about. Don’t know what I would choose. This is brilliant! What good ideas you have for the other months, too, especially the poems and new music. And pulling a weed each day would put me ahead of the game. Thanks for a great post! I love your ambitious goals for each month. My favorite is October. That’s one I’m sure I could keep up with you! This is a very cool list! It made me smile, and while I secretly harbor some ambition to try something like that myself, I also know… I struggle with follow-through and would have to seriously modify. Clever! I laughed when I read July, “Pull a weed every day.” Thanks for a great post, Fran! I may have to try this. Thanks for the idea. A great combination of the practical, the impractical and the hilarious! I love the idea of focusing on just one thing, just for a month. I never thought about applying our March pursuit to other creative tasks (and chores). Makes them seem less daunting! Thanks for the idea! Such a fun way to look at the months ahead! I love the perspective on becoming a better writer after 4 years of slicing in March! Great ideas! And it’s amazing what habits we can build and commit to after just 30 days. And of course 30 days straight can also help us discern what we don’t need to commit to. Thanks for sharing this. You make a very good point- 30 days can also tell us what we don’t care that much about and shouldn’t pursue! I love this! I might give this a go today for my slice! I LOVE this! What a smart idea for a post and for life! Thanks for sharing.